Nose: Ever evolving. Generous, mysterious, and complex. Palate/Finish: Well rounded, smooth, with a well-aged undercurrent of rancio. Long, satisfying finish. 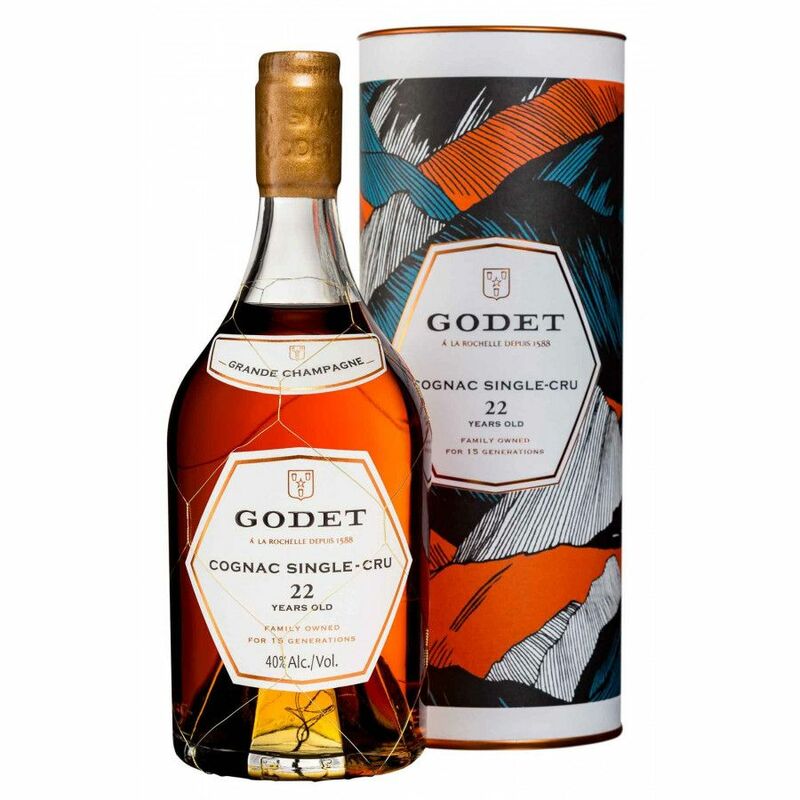 The expertise and savoir-faire of the Godet family is wholly evident in the Godet Single Cru 22 Years Old Cognac. It’s a vintage Cognac, created from eau-de-vie from the most sought after terroir of the region—Grande Champagne. At 22 years of age, this craft Cognac offers amazing quality at a truly affordable cost. And the reasons to own a bottle are ten-fold. On top of being from a vintage year and from a single cru, it’s a truly innovative offering from the talented house of Godet. Because with this selection, the house of Godet has chosen to resurrect some grape varieties that are rarely used in Cognac making today. In the distant past, growers and producers were more experimental with their creations. And it’s this that’s been embraced with this product, as it’s been produced using eau-de-vie from grapes not so commonly associated with today’s Cognacs; Namely, Colombard, Montils, and Folle Blanche. This has led to a uniquely complex taste experience that will surprise as much as it delights. And it will certainly get the connoisseurs talking and debating. Heading the house today are three brothers, Jean Edouard, Maxime, and Cyril. Find out more about this truly historic house in our blog article, Godet Cognac: Making history generation by generation. We love the way that the brothers have chosen to present their Single Cru 22 Years Cognac in traditional and simplistic packaging. The bottle is of a classic shape, nestled in a rather striking presentation tube. This makes it a wonderful gift choice for anyone who appreciates the finer things in life. And you can be sure that the liquor it cradles within will truly delight. We’d suggest that this high end Cognac is allowed to impress you in the purest of manners. This could mean enjoying in the traditional manner—neat, hand warmed, and from a tulip or balloon brandy glass. It’s the perfect way in which to end a delicious meal. But in addition, it’s also delicious on the rocks, or even with the addition of a drop or two of water. Just in the way that doing this to a good whisky can open out further flavors and aromas, it also does exactly the same with Cognac. But whatever way you choose to sip, take your time. A Cognac of this quality deserves your attention, and the time to truly savor its never-ending symphony of aromas and flavors. Discover more Cognacs created by this family-driven House.